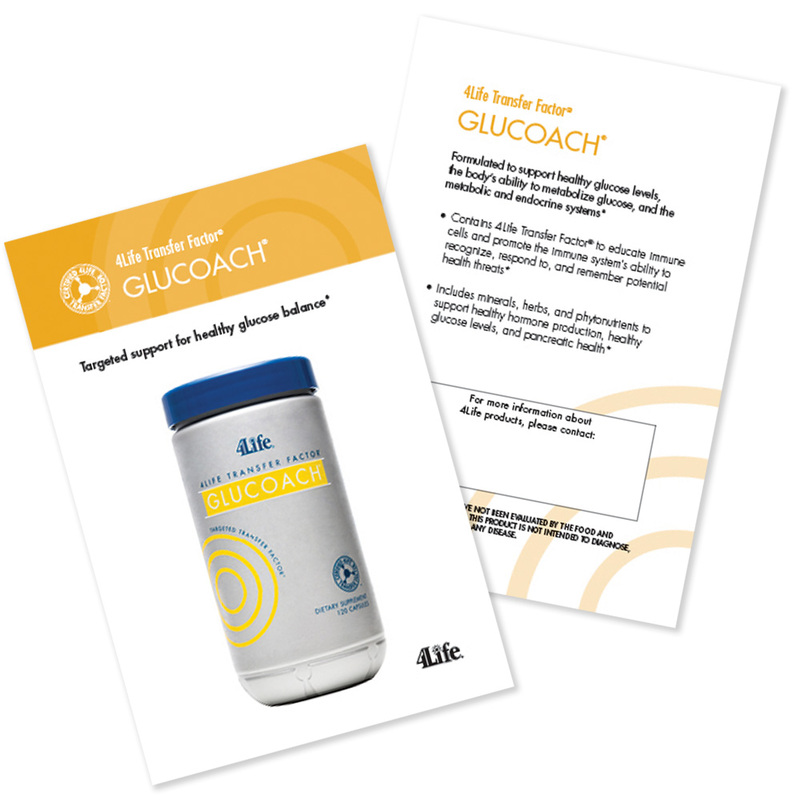 4Life Transfer Factor GluCoach supports healthy glucose levels, and the metabolic and endocrine systems. In addition to Targeted Transfer Factor®, Glucoach includes minerals, herbs, and phytonutrients to support healthy hormone production, improve glucose tolerance, and promote pancreatic health. What makes Transfer Factor Glucoach unique? 4Life Transfer Factor GluCoach targets the superior immune-enhancing benefits of transfer factors to directly support the metabolic and endocrine systems, including a normal inflammatory response. Pterocarpus marsupium, momordica charantia, (bitter melon) and gymnema sylvestre support balanced glucose levels. Both pterocarpus marsupium and gymnema sylvestre have also demonstrated an ability to support healthy pancreas function. Bitter melon helps support glucose tolerance and the body's ability to process sugars. Ginseng and fenugreek are herbs that promote healthy glucose and cholesterol levels. In addition, chromium and vanadium support glucose tolerance and healthy insulin function. The Russian Federation has also recommended 4Life Transfer Factor products for use in hospitals and clinics. This historic announcement was a result of ten separate scientific trials and two experimental studies showing the benefits of 4Life Transfer Factor products. Targeted Transfer Factor (a patented extract containing Targeted Transfer Factor from cow colostrum and egg yolks), Pterocarpus marsupium, Fenugreek, Momordica charantia, Gymnema sylvestre, Korean Ginseng, Alpha Lipoic Acid, and Vanadium.